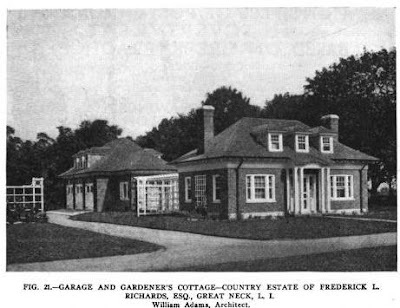 'Hazelmere', the Frederick Lloyd Richards estate designed by William Adams c. 1910 in Kings Point. Richards was a member of the New York Stock Exchange. His wife, Hazel J. Bache (daughter of Jules S. Bache), divorced him in 1936 on the grounds of cruelty and that same day married a man younger than 25 (the NYTimes points out she was over 50, however it turns out they got the groom's age wrong). Their daughter Muriel married Francis Warren Pershing in 1937, the only son of General John J. Pershing. 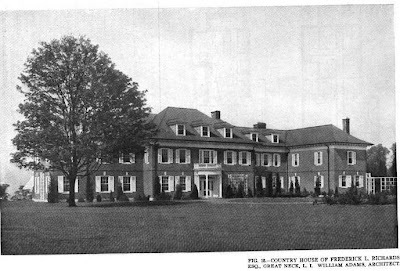 The house was demolished in the 1990s. Click below to see 'Hazelmere' intact and still standing in a 1966 aerial shot. 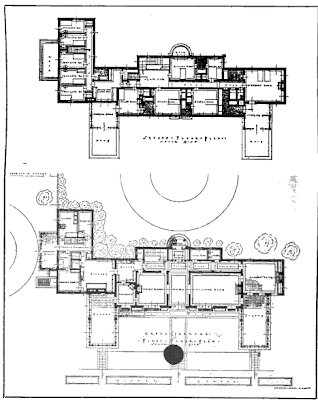 Pictures from Architectural Record, 1918.
not much from the front but WOWEE from the back. i was about to make a disparaging neo-colonial remark and then i looked at the back - impressive. in looking at the aerial - is that long allee of trees above the house in the pic the driveway? very nice. It was torn down in the late 1990's, possibly early 2000's. Stood south of Horizon Way off of Kings Point Road. There are four new homes on the property now. Thank you. I thought it was higher up. The New York Times gave the age of the groom, Frederic W. Beckman of Kankankee, Illinois, incorrectly. According to passenger records, he was born in 1900, graduated Princeton in 1922 (this according to the announcement of his first wedding, see below), and was therefore 35/36 at the time of his marriage to Hazel Bache Richards. (I've seen pictures of the pair, shortly after their marriage, and there appears to about 10-15 years' difference in ages, more or less.) And Beckman had been married once before, to a Philadelphia widow, who married him in 1934 and divorced him barely a year later. His marriage to Hazel ended with her death in 1947. 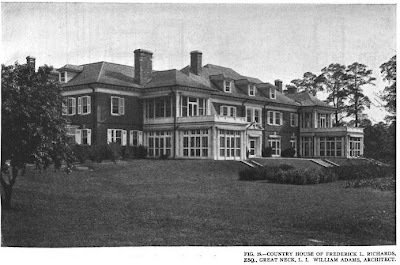 Shortly after her death Beckman took up residence in a house on Bedens Brook Road in Princeton, NJ; Gottscho photographed it on 12 May 1948. Thanks for all that AAL. When you say passenger records, where exactly were you looking? Was that just how it was quoted in the Times? Have to agree, the front facade is as dull as the back and the story are not.